Please note that the content of this book primarily consists of articles available from Wikipedia or other free sources online. 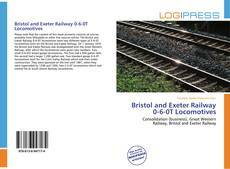 The Bristol and Exeter Railway 0-6-0T locomotives were two different types of 0-6-0T locomotives built for the Bristol and Exeter Railway. On 1 January 1876 the Bristol and Exeter Railway was amalgamated with the Great Western Railway, after which the locomotives were given new numbers. Two small 0-6-0ST broad gauge locomotives. The first had a 950 gallon tank, the second had a larger 1,200 gallon one. Two standard gauge 0-6-0T locomotives built for the Culm Valley Railway which was then under construction. They were operated on the line until 1881, when they were superseded by 1298 and 1300, two 2-4-0T locomotives which had started life as South Devon Railway locomotives.